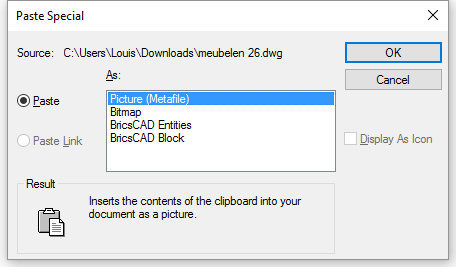 Gives you the choice of the type of object to paste from the Clipboard into the drawing (short for "paste special"). 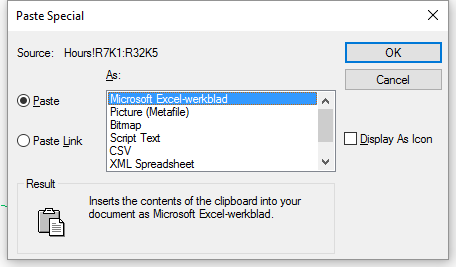 Note: Before you can use this command, first copy content from a drawing or other document to Clipboard using Edit | Copy. Choose a format under As, and then click OK. The insertion point is the first point for the mirror line. When you enter 0,0 for the insertion point, the entities are pasted to their original coordinates. Starts the Insert command and then displays the Insert Block dialog box. Fill out the properties and then click OK. The program gives a block a generated name, such as A$C5C4F59B9, and inserts it into the drawing. (This option is not available for CAD entities.) Pastes the entities in the drawing as an OLE object, and then creates a link to the originating application. (This option is not available for CAD entities.) Displays the pasted entities as an icon identifying their source application. CopyBase- copies selected entities to the Clipboard with a base point. CopyClip - copies selected entities to the Clipboard. CopyHist - copies all text from the Text window to the Clipboard. CutClip - cuts (moves) selected entities to the Clipboard. PasteBlock - pasted entities from the Clipboard as a block at an insertion point. PasteClip - pastes entities from the Clipboard into the current drawing. PasteOrig - pastes entities from the Clipboard at the original coordinates.